Much of our reading today consists of gazing at pixels on computer screens, whether desktop, tablet or smartphone. It's utilitarian and efficient. In stark contrast stands the Saint John's Bible, a magnificently oversized manuscript. Its pages of custom-made archival cotton paper are adorned with vibrant, gold-gilded illuminations and original calligraphy, all done by hand in the ancient tradition of the monks who brought the word of God to life long before the printing press was invented. St. Scholastica has become part of this legendary Bible's story, hosting a Heritage Edition print during this academic year. Commissioned by Saint John's University and the monks of Saint John's Abbey in 1998, the Saint John's Bible was the first handwritten Bible to be published in 500 years. It features 160 illustrations by six artists, and 1,150 handwritten pages written by six calligraphers. The creation of this Bible in turn inspired the publication of the Heritage Edition, a full-size, museum quality reproduction of seven-volume collections to be shared with the world. In honor of the 125th anniversary of the founding of St. Scholastica Monastery by the Benedictine Sisters, the College is a volume of the Heritage Edition. During the fall semester, the Gospels and Acts volume was on campus. It was traded out for the Pentateuch during the spring semester to provide people with the chance to experience a different book. "The Saint John's Bible is truly an awe-inspiring artwork, and I am so pleased to be able to share this treasure with the local community," said President Colette Geary. "Hosting the Bible is the perfect way to honor St. Scholastica Monastery." 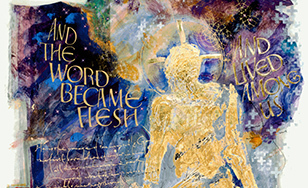 Executive Director of Alumni Engagement Lisa Roseth and Professor Bill Campbell, Ph.D., chair of the Theology and Religious Studies Department, are leading campus efforts to create programming around the Saint John's Bible. "We have seen an enthusiastic response from the College community, alumni, and other guests who have taken part in our Saint John's Bible events," Roseth said. "I look forward to the many more enriching activities we have planned during the coming months that will allow people to engage with the Bible." Campbell said he's particularly excited about how the Bible is energizing classroom discussions. "Having the Bible on campus gives us a unique opportunity to fold theological lessons into the classroom in a new way," Campbell said. "All first-year students were exposed to the Bible in a Dignitas presentation, and a number of our faculty members are taking advantage of the Bible's presence by hosting it in their classrooms. Students are coming away with a new appreciation of its sacred text." The Saint John's Bible is available for viewing daily in the St. Scholastica Library and has been displayed during events throughout the year. A two-day workshop held in February, "Image and Word for our World," featured guest speaker Jim Triggs, executive director of the Heritage Program, for a presentation entitled "Faith, Reason and The Saint John's Bible." Activities also included a panel discussion featuring St. Scholastica faculty, a makerspace for participants to experience demonstrations and hands-on opportunities, such as calligraphy demonstrations, paper making, writing with quills, etc., and a Visio Divina led by Dr. Barbara Sutton, professor at Saint John's School of Theology and Seminary. The College will host the Rev. Eric Hollas of Saint John's Abbey, who has been involved in the Saint John's Bible project since its beginnings. Father Hollas will speak on "Making All Things New: The Saint John's Bible and the Legacy of Christian Art." This event is part of the Braegelman Program in Catholic Studies Lecture Series. For details on other events, visit css.edu/Bible.